Ellie Szeryk. Photo: Golf Canada. It happens in golf all the time – signing for an incorrect score. And it always grabs the spotlight when there’s a tournament on the line. Just think 1968 Masters Tournament and then reigning British Open champion Robert De Vicenzo. Yesterday, London’s Ellie Szeryk was disqualified after her second round of the Canadian Junior Girls Championship after she signed for an incorrect score. Szeryk, 16, signed for a 6-under 66 when she actually scored 5-under 67. Golf Canada emailed this news release here with Ellie’s score of 66. It’ was a “heartbreaking way to end the tournament,” said Szeryk, calling LondonOntarioGolf.com from Tsawwassen, B.C. Yesterday, she rebounded from a first-round 5-over 77, good for T20, with a second round that would have put her in solo second place. As the Golf Canada media release reads, Szeryk was credited with a 6-under 66. In fact, she shot a 5-over 67 – it still would have seen her in solo second. Szeryk recorded six birdies Thursday at Beach Grove GC in B.C., but in the scoring tent she was wrongly given an eagle on the par-4 fifth hole. At the completion of the second round of the Canadian Junior Girls Championship at Beach Grove Golf Club in Tsawwassen, B.C., a total of 70 players had made the cut at 21-over par (165). It was brought to attention of the Tournament Committee late in the evening on Wednesday that Ellie Szeryk of London, Ont., who was sitting alone in second place in the Junior Girls Division and leading the Juvenile Girls Division at 1-under (143), had signed for a score lower than she had taken. As part of the due diligence, the Tournament Committee reviewed the scorecard with Szeryk personally, which ultimately resulted in a penalty of disqualification. A total of 69 players will now continue to compete in the final two rounds of the Canadian Junior Girls Championship. Szeryk said another golfer in her group plus the scorer both said she had scored 66. In fact, the score was triple-checked by multiple people. And the live scoring even credited her with an eagle at No. 5. Still, given the strange circumstances surrounding her scorecard, you can’t blame the talented young golfer who has already committed to attending Texas A&M University where her older sister, Maddie, just finished a stellar collegiate career. She said many have reached out to her to console her after the scoring mistake, as she prepares to take a red eye back to her home in Allen, Texas. “That’s golf. I’ve heard that this happens a lot. So hopefully I will learn from this and be even stronger for it,” she said. Next up for Ellie is the R&A Girls British Open Championship August 14-18 at Ardglass Golf Club. 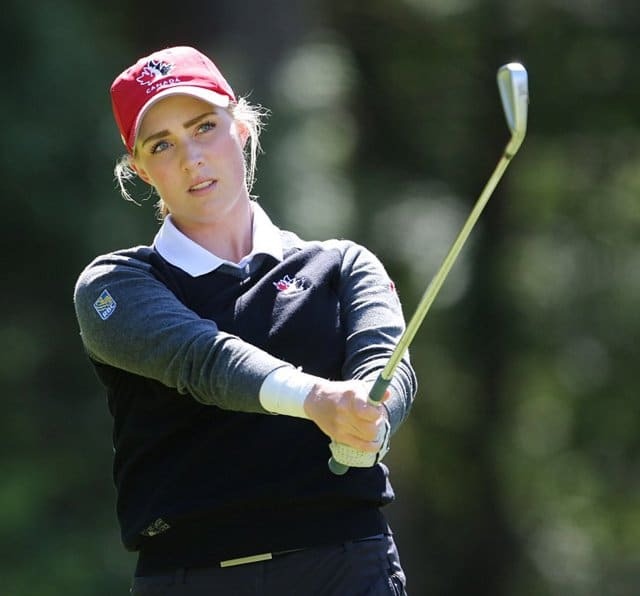 She’ll also compete for Team Canada at the World Junior Girls Championship September 9-14 at Ottawa’s Camelot G&CC before visiting family in London. Click here for more on Ellie and Maddie Szeryk. Bon Accord Creative Web Design That Matters! PGA Tour These guys are good!